ALPENA, Mich. — Talk about an exciting robotics competition. 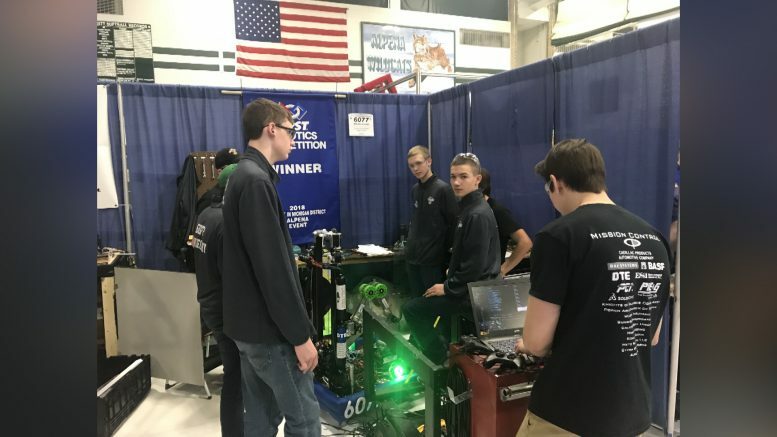 The results are in from Saturday’s FIRST Robotics Week 4 District #1 event at Alpena High School. FIRST means For Inspiration and Recognition of Science and Technology. Official results show Alpena losing in the semifinals with Hillman, Rogers City and Posen falling behind in the quarterfinals. The first alliance with team captain Enigma Robotics from West Catholic High School in Grand Rapids won. Outside the pit, Alpena won the Gracious Professionalism and Entrepreneurship awards. Onaway won the Safety and Quality awards and Rogers City won Highest Rookie Seed and the Rookie Inspiration Award. A special spotlight goes to Posen’s Wiking Kujon Team 6077. They won the District Engineering Inspiration Award, which is the second highest achievement in FIRST Robotics. It celebrates outstanding success in advancing respect and appreciation for engineering within a team’s school or organization and community, according to the FIRST Inspires website. Because of this, Posen gets to make a private presentation in front of judges at the state championship later this spring. Konecyzni said his students took inspiration from other industrial designs to build their robot, and said he couldn’t be happier of their hard work. Gear up this weekend for another district tournament. Thirty-five registered teams will make their way back to Alpena Thursday night for their qualifying event.